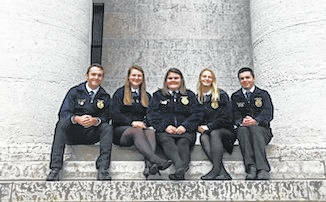 Cardington FFA members at Columbus were, from left: Brydon Ratliff, Tess Ruehrmund, Mikaela Osborne, Aubrey Curtis, and Jacob Levering. COLUMBUS — The FFA gives members experiences to help them better their leadership skills. The Ohio FFA Association held its annual Ohio Legislative Leadership Conference at the Ohio State House on Sept. 26. During this conference students spent the morning learning about agricultural issues and how they can make a difference even while in high school. They ate lunch later with state legislators and discussed issues about which they had learned. The Cardington FFA was happy to have students experience this conference and they are excited to return next year.